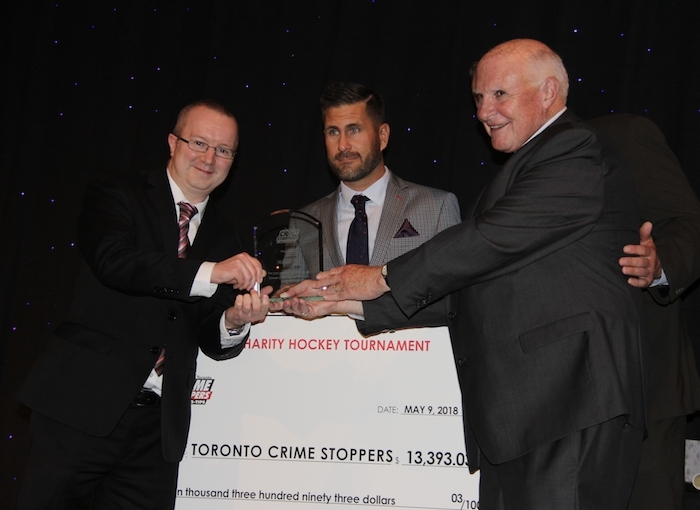 SP&T News presented Crime Stoppers with a cheque for $13,393.03 on behalf of Mission 500 at the Toronto Crime Stoppers Chief of Police Dinner, which was held at the Liberty Grand in Toronto on May 9. The money was raised in February at a security industry charity hockey tournament organized by SP&T News and supported by Hikvision, Axis Communications, Automatic Systems, TSOC, Mircom, Circle K, Securitas, Paragon Security, Graybar Canada, Anixter, Titan Products Group, 3SI Security Systems, Tyco Integrated Security, and G4S Canada. SP&T News editor Neil Sutton awarded the cheque to Gary Grant, founder and chair of the Toronto Crime Stoppers board of directors, and Sean Sportun, director of Toronto Crime Stoppers. The funds will go towards supporting youth programs. Mission 500 was awarded the Crime Stoppers Recognition Award for its support. Other awards presented that event include the Bill Hancox Award of Excellence, presented to Toronto Police Service’s Human Trafficking Team; Amiya Reis for Crime Stoppers Student of the Year; and St. Marcellus Catholic School for the John Mungham Award. The event closed with a speech from Toronto Police Chief Mark Saunders who commented on the value of community support and commended Toronto police for their great work in the city.